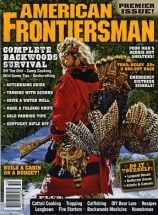 This first issue is packed with 130 pages of articles, running a gamut of topics, from a biographical essay on Davy Crockett, to how to build a debris hut when stuck in the woods, to a look at Civil War rifle-muskets, to panning for gold, butchering guide for big game, cooking with cattails (the plant), and even on to recipes, including George Washington’s recipe for making beer. As you can see, the content covers a wide range of interests, even for readers who wouldn’t dream of camping outdoors but are curious about the differences among buffalo, bison, and beefalo. If you want to read stories about mountain men such as Horace Kephart (a writer and scholar of the Appalachian Mountains) and Hugh Glass, John Colter and John Johnston (a “dynamic trio who defined what rough it really means!”) or learn how Native Americans made dugout canoes, this magazine is for you. The editors promise more “how-they-did-it-then and how-you-can-do-it-today stories that mean something.” This is a fascinating title that is recommended for public libraries.